Inflammatory mediators have the potential to impact a surprising range of diseases, including obesity and its associated metabolic syndrome. In this paper, we show that the proinflammatory cytokine IL-17 inhibits adipogenesis, moderates adipose tissue (AT) accumulation, and regulates glucose metabolism in mice. IL-17 deficiency enhances diet-induced obesity in mice and accelerates AT accumulation even in mice fed a low-fat diet. In addition to potential systemic effects, IL-17 is expressed locally in AT by leukocytes, predominantly by γδ T cells. IL-17 suppresses adipocyte differentiation from mouse-derived 3T3-L1 preadipocytes in vitro, and inhibits expression of genes encoding proadipogenic transcription factors, adipokines, and molecules involved in lipid and glucose metabolism. IL-17 also acts on differentiated adipocytes, impairing glucose uptake, and young IL-17–deficient mice show enhanced glucose tolerance and insulin sensitivity. Our findings implicate IL-17 as a negative regulator of adipogenesis and glucose metabolism in mice, and show that it delays the development of obesity. Obesity is associated with a spectrum of metabolic abnormalities including insulin resistance, hyperglycemia, high blood pressure, and dyslipidemia—collectively known as the metabolic syndrome—which are important risk factors for cardiovascular disease and type 2 diabetes (1). The development of obesity and of its associated metabolic abnormalities is dependent on genetic factors, lifestyle, and diet, but the causative connection between obesity and the metabolic syndrome remains incompletely understood. An emerging consensus, however, suggests that inflammation links obesity and metabolic dysfunction. The development of adipocytes (adipogenesis) and their function in lipid storage and metabolism are regulated in a complex fashion by hormones, lipids, sugar metabolites (2, 3), and adipokines (e.g., leptin, resistin, adiponectin, and chemerin) (4, 5), but also by inflammatory cytokines. For instance, IFN-γ (6, 7) and IL-6 (8) inhibit adipogenesis, and TNF-α induces lipolysis in mature adipocytes (9). Moreover, circulating levels of inflammatory proteins including serum amyloid A, IL-6, IL-8, IL-18, MIF, and TNF-α are increased in obese subjects (10) and are thought to contribute to insulin resistance and to low-grade systemic inflammation (11). Indeed, obesity is linked not only to heart disease (12) and diabetes (13–15), but to an increased incidence of inflammatory diseases including psoriasis (16), multiple sclerosis in humans (17) and experimental autoimmune encephalomyelitis in mice (18), and asthma (19). Recent studies implicate the proinflammatory cytokine IL-17 in several of these diseases as well (20–24). Interestingly, serum IL-17 is upregulated in obese human patients (25), and obesity is positively correlated with enhanced IL-17 expression and increased severity of inflammation in IL-17–dependent mouse models of experimental autoimmune encephalomyelitis and trinitrobenzene sulfonic acid-induced colitis (18). Although these studies suggest a link between obesity, IL-17, and inflammatory diseases, it is currently unclear whether IL-17 influences metabolism and obesity, or is merely enhanced by obesity-associated inflammatory changes. Adipocytes produce a number of cytokines in obesity, but AT is also infiltrated by immune cells that produce inflammatory and regulatory factors. For example, macrophages accumulate in obese adipose tissue (AT), where they secrete TNF-α, IL-6, IL-1, MCP-1, and MIP-1α (26–28). Cytokine-producing T cells also infiltrate AT. Interestingly, a shift from Th2 (IL-4–producing) and regulatory T cells (Tregs) to a pathogenic Th1 (IFN-γ–producing) T cell infiltration occurs during the progression of diet-induced obesity (7). Although pathogenic Th1 cells and CD8 T cells increase with obesity, Tregs, which have positive effects on metabolic parameters in part through production of IL-10, decline in frequency (7, 29, 30). The cytokines produced by infiltrating leukocytes, including T cells, are thought to play significant pathogenic and regulatory roles in adipose biology and metabolism (31). γδ+ T cells, a minor T cell subset that often responds to self-ligands (32–34) and participates in immunoregulation (35), also increases significantly in inguinal AT during obesity (36, 37), but cytokine expression by adipose γδ T cells has not been examined. In this report, we show that T cells in AT produce IL-17, and we present evidence that IL-17 is an important regulator of adipogenesis and glucose metabolism. In AT, IL-17 is produced primarily by γδ T cells, and the majority of AT γδ T cells express IL-17. IL-17 acts on preadipocytes and adipocytes to inhibit adipogenesis and moderate lipid and glucose uptake, and IL-17–deficient mice develop more severe adult-onset obesity and display altered glucose homeostasis. Our results identify IL-17 as an AT-associated cytokine that regulates adipocyte biology and metabolism. Animal studies were performed in accordance to National Institutes of Health guidelines and in accordance to guidelines set forth by Stanford University (Stanford, CA). Animal protocols were approved by the Veterans Affairs Hospitals Institutional Animal Care and Use Committee. Age-matched male mice were used for all studies. C57BL/6NCr IL-17–deficient and wild-type (WT) C57BL/6NCr (National Cancer Institute, Bethesda, MA) control mice were housed in accordance to National Institutes of Health guidelines. C57BL/6J TCRδ knockout (KO) and age-matched WT control mice were purchased from The Jackson Laboratory (Bar Harbor, ME). Mice were maintained on a 12-h light/dark cycle and given free access to food and water unless otherwise indicated. Six- to 8-wk-old mice were fed either a 10 or 60% fat diet (Harlan Laboratories, Indianapolis, IN) and weighed weekly. Food was also weighed weekly. Internal core temperatures were measured with a Traceable Thermometer and probe (Fisher Scientific, Hampton, NH). Body composition analysis was determined by dual-energy X-ray absorptiometry (DEXA) using a Discovery model DEXA scanner adapted for rodent imaging (Hologic, Bedford, MA). Calibration was performed before each set of measurements. The animals were anesthetized (i.p. injection of ketamine/xylazine) before scanning, and data were obtained according to manufacturer’s protocols. Mice were fasted for 18 h before sacrifice. Tissues were collected, weighed as indicated, and processed for leukocyte isolation. Blood was collected via cardiac puncture, allowed to clot for 30 min, centrifuged for 10 min at 5000 rpm, and the serum fraction was isolated and stored at −80°C for later analyses. Spleen and inguinal lymph nodes (ILNs) were carefully excised from fatty deposits and passed through 40-μm cell strainers (Fisher Scientific) yielding single-cell suspensions. Lymph nodes were first removed from inguinal adipose depots. Inguinal and epididymal adipose depots were carefully excised, weighed, minced, and placed into DMEM with 10 mg/ml BSA Fraction V (Sigma-Aldrich, St. Louis, MO), centrifuged at 4°C for 5 min at 1500 rpm, and the adipose fraction was then digested with 0.03 mg/ml Blendzyme 3 (Roche Applied Science, Indianapolis, IN) in the presence of 50 U/ml DNase I (Sigma-Aldrich) in digestion buffer (153 mM NaCl, 5.6 mM KCl, 2.3 mM CaCl2, 2.6 mM MgCl2, 15 mM HEPES, 1% [w/v] BSA, pH 7.4) for 1 h at 37°C. Digested samples were passed through a 100-μm cell strainer, and floating cells were collected as the adipocyte fraction and pelleted cells as the stromal vascular cell fraction. Isolated cells were resuspended in 40% Percoll (GE Healthcare, Piscataway, NJ) and underlaid with 75% Percoll. Gradients were centrifuged for 20 min at room temperature, and the cellular interface was harvested. Cells were resuspended in cDMEM, counted using a hemacytometer and trypan blue, and were treated as indicated later. One to two million isolated cells were stimulated in the presence of brefeldin A (eBioscience, San Diego, CA) for either 4 h with 40 ng/ml phorbol 12-myristate 13-acetate and 1 μg/ml ionomycin (Sigma-Aldrich) or for 8–16 h without exogenous stimulation. Cells were then stained with fluorochrome-tagged Abs against cell surface markers (CD3ε, CD4, CD8α, NK1.1, β TCR, and/or γδ TCR) and intracellular cytokines as indicated (IFN-γ and IL-17), following recommended procedures (eBioscience). Data were collected on an LSRII cytometer using FACSDiva (BD Biosciences, San Jose, CA) software, followed by FlowJo (Tree Star, Ashland, OR) analysis. Plots are represented using the biexponential transformation function to allow visualization of events close to or below the axes. 3T3-L1 preadipocytes were seeded in 12-, 24-, or 48-well culture plates and incubated at 37°C in DMEM with 10% bovine calf serum. Two days postconfluency (day 0), media were replaced with DMEM supplemented with 10% FBS, penicillin/streptomycin, 400 ng/ml dexamethasone (Sigma-Aldrich), 0.5 mM 3-isobutyl-1-methylxanthine (Sigma-Aldrich), and 0.07 mg/ml bovine insulin (Sigma-Aldrich) to induce differentiation in the presence or absence of a range of recombinant mouse IL-17 (R&D Systems, Minneapolis, MN) concentrations. Differentiation media and IL-17 were replaced 48 h later. Ninety-six hours after the start of differentiation (day 4), the media was removed and replaced with lipid loading media (DMEM plus 10% FBS with penicillin/streptomycin). Cells were kept in lipid loading media between 2 and 14 d, with fresh changes of media every 2–3 d. Cells were harvested for RNA, stained for lipid, or used for functional assays as indicated. Two-day postconfluent 3T3-L1 preadipocytes were serum-starved in DMEM + 1% fatty-acid free BSA (FAF BSA) for 4–8 h. Cells were then left untreated or were stimulated with either 1 μg/ml PMA or 100 ng/ml mouse recombinant IL-17 (R&D Systems) in DMEM + 1% FAF BSA for 5, 10, 15, or 30 min. Immediately after, cells were washed twice with ice-cold PBS and harvested in radioimmunoprecipitation assay buffer supplemented with protease and phosphatase inhibitors (Thermo Scientific, Rockford, IL). Cells were homogenized with a needle and syringe, and protein concentration was measured using the bicinchoninic acid method (Thermo Scientific). Ten micrograms total protein was separated on a 4–20% SDS-polyacrylamide gel (Bio-Rad, Hercules, CA) and then transferred to a polyvinylidene difluoride membrane (GE Healthcare). Membranes were blocked for 2 h at room temperature with 5% nonfat dry milk in PBS and were then incubated overnight at 4°C with the primary Ab in 5% milk in PBS. All primary Abs were purchased from Cell Signaling Technology (Beverly, MA) and used at a 1:1000 dilution (phospho-Erk1/2 #4370, total Erk1/2 #9102, phospho-AKT #4058, total AKT #9272, phospho–NF-κB #3033, total NF-κB #4764). Membranes were then washed with PBS + 0.5% Tween 20 and incubated with goat anti-rabbit secondary Ab conjugated to HRP (Sigma-Aldrich) diluted 1:2000 in 5% milk for 2 h at room temperature. Membranes were then washed and exposed via ECL (PerkinElmer, Wellesley, MA). Blots were then stripped with stripping buffer (Thermo Scientific) per manufacturer’s recommendations and reprobed with a different primary Ab. The media from 2-d lipid-loaded 3T3-L1 adipocytes was removed from each well and cells were washed with PBS, then distilled water, and fixed with 4% paraformaldehyde for 30 min at room temperature. Fixative was aspirated and cells were washed with PBS and then distilled water. Water was then aspirated and the cells coated with a saturated oil red O solution in 60% isopropanol. The cells were incubated at room temperature for 50 min, after which the staining solution was removed and the cells washed with water followed by a 70% ethanol wash. Ethanol was removed and replaced with PBS followed by light microscopy and imaging. Total lipid was extracted from mature 3T3-L1 adipocytes with 3:2 hexane/isopropanol mix. Extracted lipid was then dried under a vacuum and resuspended in absolute ethanol. Total triglyceride was measured using a triglyceride quantification kit (Sigma-Aldrich) per the supplier’s recommendations. After lipid extraction, total protein from culture wells was resuspended with 1N NaOH. Total protein was determined using bicinchoninic acid reagent (Thermo Scientific) following manufacturer's recommendations. Two-day postconfluent 3T3-L1 preadipocytes (96-well plates) were treated with differentiation media for 24 h in the presence or absence of a range of IL-17 concentrations. [3H]Thymidine was added for the last 18 h of culture, and thymidine incorporation was assessed using a β-plate scintillation counter. RNA from cultures was extracted using a Ribopure (Ambion, Austin, TX) kit per the supplier’s instructions. Gene expression was determined by quantitative PCR (qPCR) using an Applied Biosystems (Foster City, CA) 7900HT real-time PCR instrument. Total RNA (5 μg) was subjected to treatment with DNase (Roche Molecular Biochemicals) according to the manufacturer’s instructions to eliminate possible genomic DNA contamination. DNase-treated total RNA was reverse-transcribed using Superscript II (Invitrogen Life Technologies) according to manufacturer’s instructions. Primers for peroxisome proliferative activated receptor γ (PPAR-γ; forward: 5′-TCGCTGATGCACTGCCTATG-3′, reverse: 5′-GAGAGGTCCACAGAGCTGAAT-3′), perilipin (forward: 5′-ACACTCTCCGGAACACCATC-3′, reverse: 5′-CCCTCCCTTTGGTAGAGGAG-3′), hormone-sensitive lipase (HSL; forward: 5′-GCTTGGTTCAACTGGAGAGC-3′, reverse: 5′-GCCTAGTGCCTTCTGGTCTG-3′), glucose transporter type 4 (forward: 5′-ACTCTTGCCACACAGGCTCT-3′, reverse: 5′-AATGGAGACTGATGCGCTCT-3′), adipose triglyceride lipase (forward: 5′-AACACCAGCATCCAGTTCAA-3′, reverse: 5′-GGTTCAGTAGGCCATTCCTC-3′), and chemokine-like receptor 1 (CMKLR1, forward: 5′-CAAGCAAACAGCCACTACCA-3′, reverse: 5′-TAGATGCCGGAGTCGTTGTAA-3′) were designed using Primer Express (Applied Biosystems, Foster City, CA). Other primers, for which sequences are unavailable, were obtained commercially from Applied Biosystems. Real-time RT-PCR on 10 ng cDNA from each sample was performed using either of two methods. In the first method, two gene-specific unlabeled primers were used at 400 nM in a PerkinElmer SYBR Green real-time qPCR assay using an ABI 5700 instrument (Applied Biosystems). In the second method, two unlabeled primers at 900 nM each were used with 250 nM FAM-labeled probe (Applied Biosystems) in a TaqMan real-time qPCR on an ABI 7700 sequence detection system. The absence of genomic DNA contamination was confirmed using primers that recognize the genomic region of the CD4 promoter. Ubiquitin levels were measured in a separate reaction and used to normalize the data. Using the mean cycle threshold (Ct) value for ubiquitin and the gene of interest for each sample, the Equation 1.8 e (Ct ubiquitin − Ct gene of interest) × 104 was used to obtain the normalized values. Differentiated 3T3-L1 adipocytes were washed with PBS and serum-starved for 4 h in DMEM with 0.5% FAF-BSA. Cells were washed and changed to DMEM without glucose with 0.5% FAF-BSA with or without 100 ng/ml IL-17 for 1 h. Insulin, 1 μM, was added to the cells, as indicated, for 15 min before adding labeling mixture containing 2 μCi [3H]deoxyglucose and 5 mM cold deoxyglucose. After 15 min of incubation, media were aspirated, cells were washed twice with ice-cold PBS and harvested in Tris-EDTA with 0.1% Triton X-100. Cells were lysed by shaking and vigorous vortexing. Cell lysates were centrifuged, and aliquots of the supernatants were assayed for [3H]deoxyglucose in scintillation fluid. Fasted mice were injected i.p. with d-glucose dissolved in 0.9% sterile saline (1 or 1.5 g d-glucose/kg body weight; Sigma-Aldrich) or with human insulin (1 U insulin/kg body weight; Lilly Research Laboratories, Indianapolis, IN). Blood glucose concentrations were measured before and 20, 40, 60, and 120 min after injection with a Precision Xtra glucometer (Abbott Laboratories, Abbott Park, IL). Serum from fasted mice was collected and assayed for insulin, IL-6, and leptin using a Milliplex Map mouse serum adipokine panel kit (Millipore, Bedford, MA), per the manufacturer’s recommendations. Data were collected using a Luminex 200 System (Luminex, Austin, TX). Data are expressed as the mean of replicate measurements or mean normalized values between multiple experiments ± SEM. For comparisons between two groups, statistical significance was evaluated using the Student t test (two-tailed, α = 0.05) assuming unequal variance. For comparisons across multiple groups (either within a given day/tissue or across multiple days/tissues), one-way ANOVA was used (Holm–Sidak method; SigmaStat 3.0; Systat Software, Chicago, IL). To determine whether AT contained IL-17–producing T cells, we initially studied leukocytes from the stromal vascular fraction of inguinal (s.c.) and epididymal (visceral) adipose depots from mice fed a high-fat (HF) diet for 18 wk. Leukocytes were stimulated with PMA and ionomycin, in the presence of brefeldin A, for 4 h to induce intracellular accumulation of expressed cytokines. The stimulated cells were stained with Abs to CD3, CD4, CD8, and γδ TCR to identify T cell subsets, followed by intracellular staining for IL-17 or IFN-γ. Lymphocytes from ILN and spleen were analyzed for comparison. We found that IL-17–producing T cells are present in AT (Fig. 1A), and the great majority of these are CD4−, CD8− T cells that express the γδ TCR (γδ17 cells; Fig. 1B and data not shown). Although γδ T cells represent only ~4–11% of CD3+ T cells in these tissues, γδ17 T cells comprised between 70 and 90% of IL-17–producing CD3+ cells in inguinal AT, and between 80 and 90% in epididymal AT. IL-17 expression by AT leukocyte subsets. A–C, Leukocytes were isolated from spleen, ILN, inguinal (Ing.) AT, and epididymal (Epi.) AT from male mice fed an HF diet for 18 wk. Cells were stimulated with PMA and ionomycin for 4 h in the presence of brefeldin A. Intracellular expression of IL-17 and IFN-γ was assessed on the indicated T cell subsets, defined by staining for CD3, CD4, CD8, and γδ TCR. A, Evaluation of CD3 and IL-17 expression by tissue leukocytes. B, Expression of γδ TCR, CD4, or CD8 by CD3+IL-17+ cells gated in A. 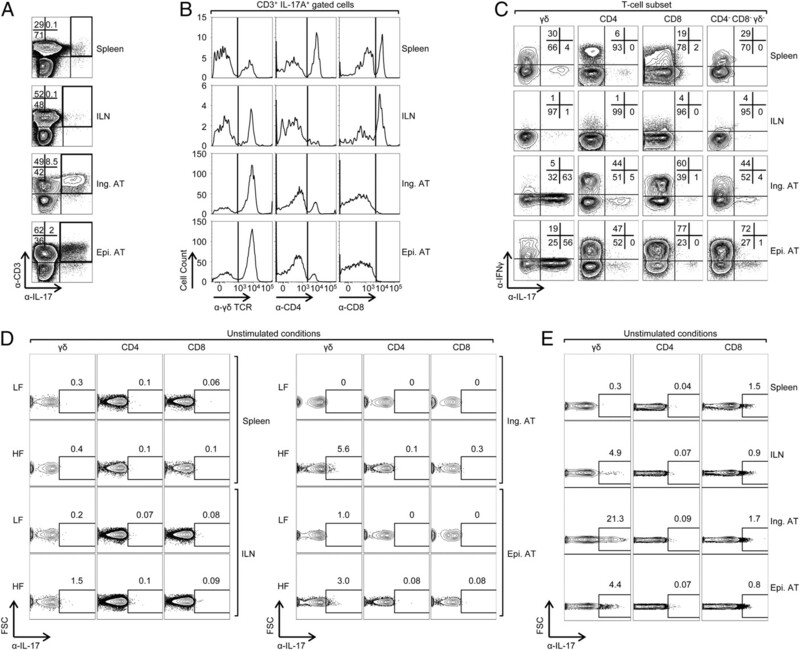 C, Stimulated expression of IL-17 and IFN-γ by various tissue T cell subsets. D and E, Evaluation of spontaneous IL-17 expression: Cells were isolated from male mice fed a HF diet for 16–18 wk (D) or 12 mo (E) and were cultured for 8–16 h in medium supplemented with brefeldin A without exogenous stimulation, followed by intracellular staining for IL-17. Data are representative of two to five experiments with similar results. IFN-γ is expressed by AT infiltrating T cells in obesity. We therefore compared the expression of IL-17 with that of IFN-γ in each of the T cell subsets (Fig. 1C). Conventional CD4 and CD8 T cells in AT contained a high frequency of IFN-γ–producing Th1 and Tc1 cells, respectively, but, consistent with recent reports (7), Th17 and Tc17 cells were rare. In contrast, the majority of AT γδ T cells stimulated with PMA and ionomycin expressed IL-17, but relatively few γδ T cells expressed IFN-γ, particularly in the s.c. (inguinal) AT. A smaller fraction of IL-17–producing CD3+ T cells are found among the CD4− CD8− and γδ TCR− compartment, which comprise NKT cells and so-called double-negative αβ T cells; but these are much less frequent than γδ17 T cells in normal mice. Expression of IL-17 and IFN-γ is mutually exclusive in all these populations. To determine whether γδ T cells from AT spontaneously secrete IL-17, or whether secretion requires exogenous stimulation, tissue leukocytes were incubated in medium in the presence of brefeldin A only. Under these conditions, expression of IL-17 was detectable by flow cytometry in a subset of γδ T cells from both adipose depots of mice fed a HF diet for 16–18 wk (Fig. 1D). The frequency of spontaneous IL-17 expression by inguinal AT γδ T cells increased with age in obese mice as well (Fig. 1E) but remained relatively rare among CD4 or CD8 T cells. In the absence of stimulation, IFN-γ was expressed by few, if any, γδ, CD4, or CD8 T cells from secondary lymphoid tissue or AT from HF-fed mice at 16–18 wk or 12 mo (data not shown). Commitment of effector/memory cells to production of particular cytokines is usually assessed by short-term, nonspecific stimulation with PMA and ionomycin. We therefore evaluated PMA- and ionomycin-stimulated IL-17 expression by T cells in AT of mice fed either a low-fat (LF; 10% fat) or HF (60% fat) diet for 18 wk. Mice were 6 wk old at the beginning of the study. On sacrifice, the average weight for mice fed a LF diet was 36.0 ± 0.9 g (SEM; n = 5), whereas mice fed an HF diet weighed an average of 48.8 ± 2.4 g (SEM; n = 5). As expected, the difference in weight between groups primarily reflected AT mass differences, as shown by DEXA analysis (data not shown). Flow cytometric analysis revealed an increase in the percentage of IL-17–producing T cells in obese inguinal AT (Fig. 2A); this increase was primarily attributable to an increased frequency and number of γδ17 T cells per gram of AT (Fig. 2B, 2C). There was a significant increase in Th17 cell frequency and number in inguinal AT as well, but γδ17 cells were consistently seven to eight times more abundant in both LF and HF inguinal AT. In contrast with inguinal AT, epididymal AT in obese mice displayed a reduction in the frequency of IL-17–producing T cells, but this reflected primarily an increase in the number of CD8+ T cells (data not shown), consistent with a recent report demonstrating increased CD8+ T cell content in obese visceral AT (30). The actual number per gram of γδ17, Th17, and Tc17 cells in epididymal AT was similar in LF and HF mice (Fig. 2B, 2C). As in inguinal adipose depots, γδ T cells were the main producers of IL-17 in epididymal AT. No significant differences in IL-17–producing T cells or T cell subsets were observed in spleens or ILNs between groups. Diet-induced differences in IL-17 expression by tissue T cell subsets. Six-wk-old male C57BL/6NCr mice were fed a LF (10% fat) or HF (60% fat) diet for 3 mo. Spleen, ILN, inguinal (Ing.) AT, and epididymal (Epi.) AT were harvested; AT was weighed; and tissue cells were analyzed for T cell content and stimulated intracellular IL-17 as in Fig. 1. Five mice per group were analyzed, and mean values are given with SEM. A, Percentage of tissue CD3+ T cells expressing IL-17. *p < 0.003 versus LF Ing. AT; **p < 0.04 versus HF Epi. AT; Holm–Sidak multiple-comparison test. The mean representation of CD4, CD8, and γδ T cells among the IL-17–expressing pool is indicated within the bars. B, Frequency of IL-17+ cells of the indicated phenotype, expressed as a percentage of the total CD3+ T cell pool. γδ: *p < 0.004 versus LF Ing. AT; **p < 0.04 versus HF Epi. AT; CD4: *p < 0.001; Holm–Sidak multiple comparison test. C, Number of recovered IL-17+ cells of the indicated T cell phenotype per gram AT. γδ: *p < 0.02 versus LF Ing. AT; CD4: *p < 0.001 versus LF Ing. AT; Student t test. Data are from individual experiments and are representative of three experiments with similar results. To determine the effect of IL-17 on the development of obesity, we fed 6- to 7-wk-old IL-17 WT and IL-17 KO mice either a LF or HF diet for 14–18 wk and measured body mass weekly. IL-17 KO mice reached a significantly greater weight than their WT cohorts over time in both the LF and HF conditions (Fig. 3A, 3B, respectively). DEXA analysis indicated differences in body mass were mainly attributable to body AT composition (Fig. 3C, 3D). Food consumption and body temperatures were measured and were not detectably different between the groups. Enhanced susceptibility of IL-17 KO mice to dietary obesity. 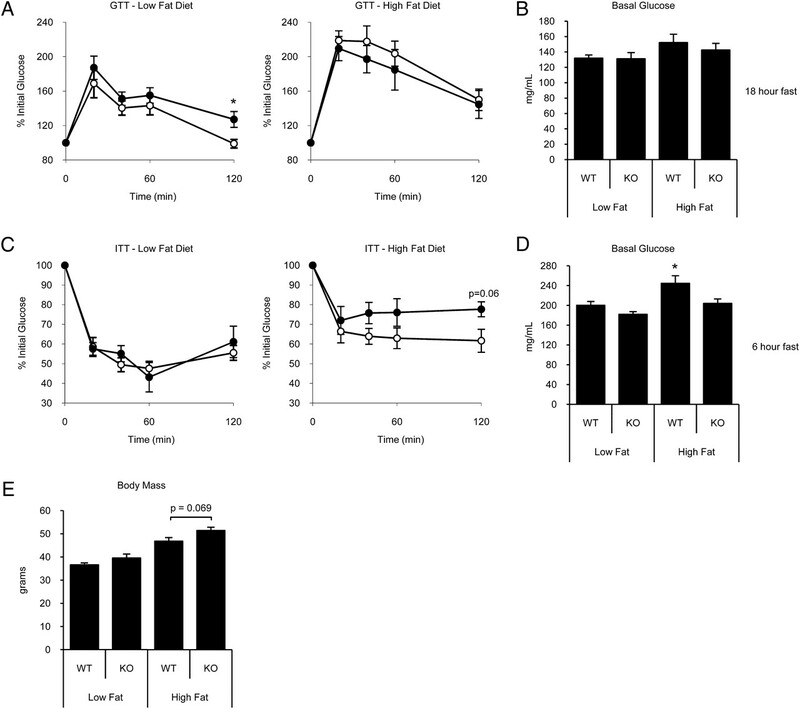 Six- to 7-wk-old IL-17 WT (n = 25–30 per group) and IL-17 KO (n = 14–26 per group) male mice were fed an LF (10% fat) (A) or HF (60% fat) (B) diet and their weights were measured over time. Data are pooled from three independent experiments, each consisting of 4–10 mice per group, and are presented as mean body mass ± SEM. *p < 0.05 between IL-17 WT and KO groups at the indicated time points; Student t test. Mice from A and B were analyzed for body AT mass (C) and lean mass (D) content by DEXA after 3 mo of feeding. Results are expressed as mean tissue mass ± SEM. Significance was determined using Student t test, and p values are represented between IL-17 WT and KO groups. Data for C and D are from a single experiment and are representative of three individual experiments with similar results. Based on the expression of IL-17 by AT T cells and the effect of IL-17 deficiency on diet-induced obesity, we hypothesized that IL-17 might act directly on adipocytes or their progenitors and alter their biology. RT-PCR confirmed that primary adipocytes (Fig. 4A) and 3T3-L1 preadipocytes (data not shown) express IL-17R A mRNA. To assess functional responses, we asked whether IL-17 could activate downstream signaling molecules (ERK, Akt, and NF-κB) in 3T3-L1 preadipocytes. Two-day postconfluent 3T3-L1 cells were serum-starved for 4–8 h followed by treatment with IL-17 or PMA. NF-κB p65 was phosphorylated at time zero, and its phosphorylation was not significantly or consistently altered by IL-17 treatment over the time course (data not shown). However, IL-17 treatment led to phosphorylation of AKT and ERK1/2 within 5 min (Fig. 4B). The timing of signaling through these pathways helps determine the outcome of adipogenic differentiation and gene expression in a complex and context-dependent manner (38). We conclude that adipocytes express functional IL-17Rs. IL-17 inhibits adipogenesis in 3T3-L1 preadipocytes. A, Expression of IL-17RA mRNA in AT. Primary inguinal adipose depot adipocyte RNA was isolated and assayed for IL-17RA expression via RT-PCR. Escherichia coli RNA used as a negative control and mouse embryonic fibroblast (MEF) RNA as a positive control. Genomic DNA contamination was assessed in samples without reverse transcriptase added (No RT). B, IL-17 activates signaling pathways in preadipocytes. Confluent, 4- to 8-h serum-starved 3T3-L1 preadipocytes were treated with 100 ng/ml IL-17 for times indicated before being harvested for protein. Phosphorylated and total ERK and AKT were detected by Western blot analysis. C and D, IL-17 treatment during preadipocyte differentiation inhibits lipid accumulation. Day 0 3T3-L1 preadipocytes were treated with differentiation media with or without IL-17 for 2 d. Day 2 media was replaced with lipid-loading media supplemented with insulin only and incubated for 2 d. Finally, day 4 media was replaced with lipid-loading media only and allowed to load lipid for an additional 2 (C) or 6 days (D). C, Two-day lipid-loaded cells were treated with hexane to extract total lipid and assayed for triglyceride (TG) and protein content (n = 6 replicates). Undifferentiated (Undiff) 3T3-L1 cells were grown alongside differentiated cells and are included for comparison. TG data are represented as milligram TG per milligram protein ± SEM. *p < 0.02 versus indicated conditions; Holm–Sidak multiple-comparison test. Data are representative of five independent experiments. D, Six-day postinduction lipid-loaded cells were treated with formalin and stained with oil red O. Representative images for each condition are shown. Cells were photographed at ×100 magnification. E, 3T3-L1 preadipocyte proliferative response to IL-17. Day 0 3T3-L1 preadipocytes were treated with differentiation media with or without IL-17 for 24 h and assessed for [3H]thymidine incorporation (n = 6 replicates). Data are presented as mean counts per minute ± SEM (p < 0.001 versus all other conditions). Data are representative of two independent experiments. To determine whether IL-17 signaling could influence adipocyte differentiation, we exposed 3T3-L1 preadipocytes to adipogenic conditions either in the presence or absence of IL-17. After 2 d under differentiating conditions, we allowed the resulting cells to take up and accumulate lipid from loading media. 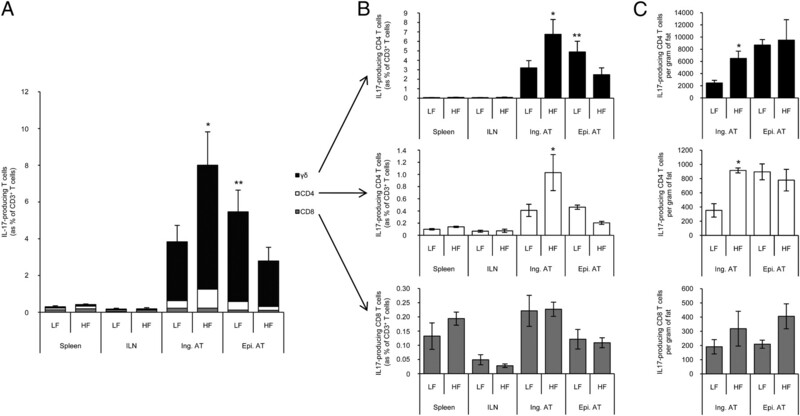 The presence of IL-17 during differentiation significantly inhibited subsequent lipid uptake as assessed by triglyceride analysis or staining for neutral lipids with oil red O (Fig. 4C, 4D). IL-17 did not inhibit the proliferative burst (mitotic clonal expansion) induced by addition of the differentiation media (39) as measured by [3H]thymidine incorporation assays (Fig. 4E) and did not show any evidence of cell toxicity as measured by alamar blue cytotoxicity assays (data not shown). In addition to its effect on lipid accumulation, IL-17 suppressed the induction of adipocyte-associated genes in response to differentiation medium, as assessed by qPCR analysis. As expected, in the absence of IL-17, 3T3-L1 cells differentiated well, leading to upregulation of mRNAs for proadipogenic transcription factors (C/EBP-α, PPAR-γ), adipocyte-related cytokines (leptin, resistin, adipsin, adiponectin, chemerin, and the chemerin receptor CMKLR1), and genes involved in lipid (fatty acid binding protein 4, HSL, perilipin, adipose triglyceride lipase) and glucose (glucose transporter-4) metabolism (Fig. 5); IL-17 treatment, however, significantly impaired the expression of most of these genes (Fig. 5A–G). In contrast, IL-17 treatment induced IL-6 mRNA expression, an effect that was rapidly reversed on removal of IL-17 (Fig. 5H). CMKLR1, resistin, adiponectin, and HSL displayed nonsignificant downregulated expression with IL-17 treatment. IL-17 inhibits induction of adipocyte genes. On day 0, 3T3-L1 preadipocytes were treated with differentiation media with (+) or without (−) 100 ng/ml IL-17 for 2 d (day 2 samples). Media were then replaced with lipid-loading media supplemented with insulin only and incubated for 2 d (day 4 samples). Finally, on day 4, media were replaced with lipid-loading media only and allowed to load lipid for 2 more days (day 6). RNA was isolated, for qPCR analysis, either 2, 4, or 6 d after differentiation media were added. Ct values were normalized to ubiquitin B values within each sample. To allow pooling of data from different experiments, we then normalized results for each gene to values from 5-d postconfluent undifferentiated 3T3-L1 control cells (included in each experiment). Results are presented as mean gene expression relative to undifferentiated control cells from three independent experiments ± SEM. Significance was determined using Student t test, and p values are represented between IL-17–treated and untreated conditions. ATGL, adipose tissue triglyceride lipase; FABP4, fatty acid binding protein 4; GLUT4, glucose transporter-4. We next asked whether IL-17 could modulate metabolic processes in mature adipocytes. We focused on glucose uptake, a key indicator of altered metabolism in metabolic syndrome and diabetes. To evaluate glucose uptake in vitro, we allowed differentiated 3T3-L1 adipocytes to load lipid for 10–14 d. After 4-h starvation, cells were cultured in glucose-free medium for 1 h in the presence or absence of 100 ng/ml IL-17 before addition of a labeling mixture containing [3H]deoxyglucose with and without insulin. Insulin stimulation alone led to a 2.5-fold increase in glucose uptake. IL-17 substantially inhibited this insulin effect, reducing glucose uptake to near-basal levels. IL-17 alone did not significantly alter basal glucose uptake in the absence of insulin (Fig. 6A). IL-17 inhibits glucose uptake in vitro and improves metabolic parameters before the onset of obesity. A, In vitro glucose uptake: mature 3T3-L1 adipocytes were allowed to load lipid for 10-14 d. Cells were serum starved for 4 h, then washed and switched to glucose-free media with or without 100 ng/ml IL-17 for 1 h. Insulin, 1 μM, was added to some wells, as indicated, for 15 min before adding [3H]deoxyglucose. After 15-min additional incubation, cells were washed and assayed for radiolabeled deoxyglucose content. Results are expressed as mean dpm ± SEM. *p < 0.03 versus basal; **p < 0.001 versus all other treatments; Holm–Sidak multiple-comparison test. B and C, In vivo glucose and insulin challenge. Ten-week-old LF diet-fed IL-17 WT (open circles; n = 9–10) and KO (closed circles; n = 9) male mice were fasted for 6 h and injected i.p. with either 1.5 g glucose/kg body weight (B) or 1 U insulin/kg body weight (C). Blood glucose was measured before and after injection at the times indicated. Results are expressed as mean percentage initial glucose ± SEM. *p < 0.05 between IL-17 WT and KO groups at indicated time points; Student t test. Insets represent basal (fasting) glucose levels for each assay, expressed as mean total glucose (mg/dl) ± SEM (*p < 0.04 versus KO; Student t test). D–G, 10-wk-old LF-fed IL-17 WT (n = 9–10) and KO (n = 9) male mice were fasted for 6 h, and serum was collected and assayed for insulin (D), IL-6 (E), adiponectin (F), and leptin (G). Results are expressed as mean analyte concentration ± SEM. *p < 0.05 versus KO; **p < 0.03 versus KO; Student t test. Data are from individual experiments and are representative of three experiments with similar results. To determine whether IL-17 might have a role in glucose metabolism in vivo, we evaluated glucose homeostasis in IL-17–deficient mice. IL-17 KO mice had slightly increased fasting glucose levels compared with their WT counterparts (Fig. 6B, 6C, insets). In a standard glucose tolerance test (GTT), IL-17 KO mice displayed improved glucose clearance compared with IL-17 WT mice, and they were more sensitive to insulin-induced hypoglycemia (Fig. 6B, 6C). Interestingly, KO mice also had lower basal insulin (Fig. 6D) and IL-6 levels (Fig. 6E), together with higher adiponectin (Fig. 6F). Serum leptin was similar between groups (Fig. 6G). Together, these results implicate IL-17 in the homeostatic regulation of glucose metabolism. To determine whether IL-17–dependent effects on metabolism were still significant in older mice, we performed GTTs (Fig. 7A) and insulin tolerance tests (Fig. 7C) on mice fed an LF or HF diet for 14–16 wk (~6 mo of age at the time of the tests). As expected, mice on the HF diet displayed impaired glucose tolerance and increased insulin resistance compared with mice fed the LF diet. Surprisingly, however, no significant differences between WT and IL-17 KO cohorts were observed: if anything, IL-17 deficiency increased rather than decreased insulin tolerance, although this did not achieve statistical significance. Because of the fact that obese mice generally have significantly greater basal glucose than lean mice (Fig. 7D, WT mice), we found it necessary to fast older mice for a longer period (18 h) before performing GTTs to gather data that was within the detection limits of the glucometer used (<500 mg/dl). Eighteen-hour fasted mice showed no significant differences in basal glucose levels; however, WT mice fed a HF diet trended toward greater basal glucose (Fig. 7B). In contrast with young mice, 6-h fasted HF IL-17 KO mice had lower basal glucose than HF WT mice (Fig. 7D). At this age, IL-17–deficient mice fed either diet were only modestly more obese than their WT cohorts (Fig. 7E). We hypothesize that the metabolic influence of IL-17 is compromised or overwhelmed by other pathogenic or physiologic regulatory mechanisms once obesity is established. Obesity with age reverses protection from metabolic syndrome conferred by IL-17 deficiency. A and C, IL-17 WT (closed circles; n = 5 per group) and KO (open circles; n = 4–5 per group) mice fed a LF or a HF diet for 14–18 wk were fasted for 18 h and injected i.p. with 1 g glucose/kg body weight (A) or were fasted for 6 h and injected i.p. with 1 U insulin/kg body weight (C). Blood glucose was measured before and after injection at the indicated time points. Results are expressed as mean percentage initial glucose ± SEM. *p < 0.05 between IL-17 WT and KO groups at indicated time points. Fasting blood glucose for the GTT (B) and ITT (D) are represented as mean total glucose (mg/ml) ± SEM. *p < 0.05 versus all other conditions; Holm–Sidak multiple-comparison test. E, Body mass from mice described in A–D. Results are expressed as mean body mass ± SEM (Student t test). Data are from individual experiments and are representative of two experiments with similar results. To determine whether γδ T cells are essential for the IL-17 effects on AT and metabolism, we analyzed TCRδ-deficient mice (γδ KO). We hypothesized that γδ T cell deficiency would mirror IL-17 deficiency, significantly enhancing diet-induced obesity and reversing the IL-17 inhibition of glucose metabolism in young mice. Unlike IL-17–deficient mice, however, γδ KO mice showed no significant difference from WT mice in weight gain (Fig. 8A). In some cohorts, young γδ KO mice, like IL-17 KO mice, displayed greater basal glucose than their WT cohort, but this was not consistent. 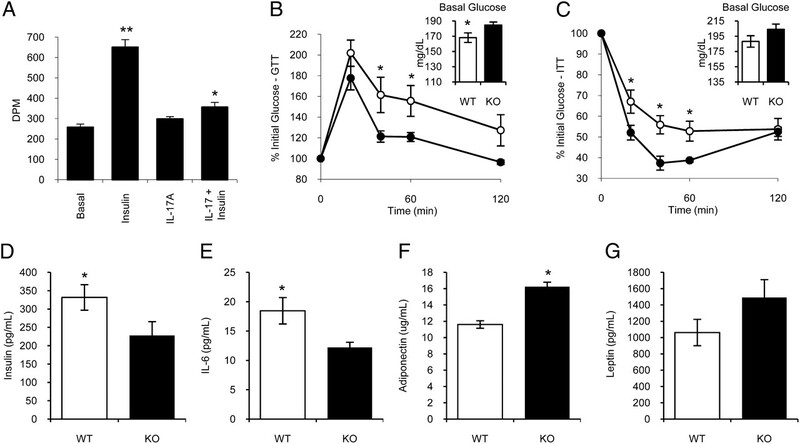 Moreover, γδ KO mice did not differ from WT mice in glucose or insulin tolerance (Fig. 8B, 8C). 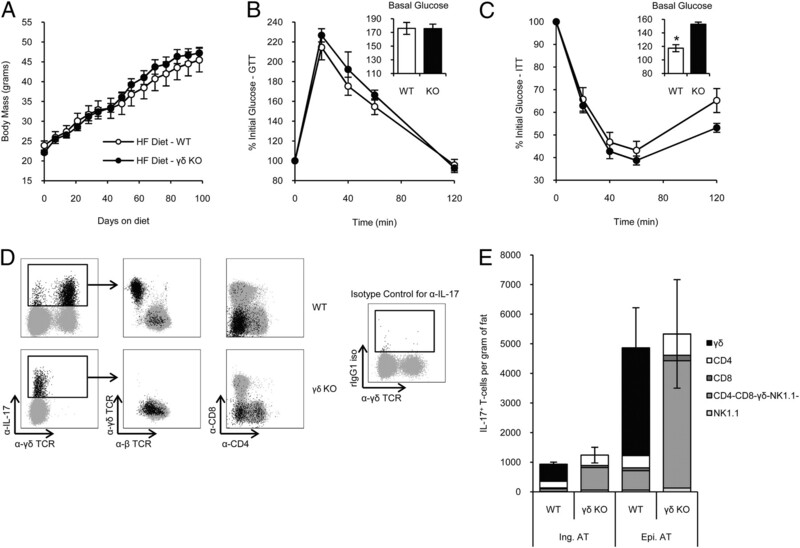 Thus, γδ T cell deficiency does not recapitulate the metabolic effects of IL-17 deficiency, suggesting the potential for compensatory sources of IL-17. Evaluation of diet-induced obesity, glucose tolerance, insulin tolerance, and AT leukocyte cytokine expression in γδ T cell-deficient mice. A, Six- to 8-wk-old C57BL/6J WT (n = 5 per group) and TCRδ KO (n = 5 per group) male mice were fed an HF (60% fat) diet, and their weights were measured over time. Results are expressed as mean body mass ± SEM. B and C, In vivo glucose and insulin challenge, respectively. Eight- to 10-wk-old C57BL/6J WT (open circles; n = 5 per group) and TCRδ KO (closed circles; n = 5 per group) male mice were fed a 60% fat diet. Mice were fasted for 6 h and injected i.p. with either 1.5 g glucose/kg body weight (B) or 1 U insulin/kg body weight (C). Blood glucose was measured before and after injection at the times indicated. Results are expressed as mean percentage initial glucose ± SEM. *p < 0.05 between WT and KO groups at indicated time points; Student t test. Insets represent basal (fasting) glucose levels for each assay, expressed as mean total glucose (mg/dl) ± SEM. *p < 0.04 versus KO; Student t test. D and E, Leukocytes were isolated from inguinal (Ing.) or epididymal (Epi.) AT from C57BL/6J WT (n = 4–5 per group) and TCRδ KO (γδ KO; n = 4–5 per group) male mice fed an HF diet for 16–20 wk. Cells were stimulated with PMA and ionomycin for 4 h in the presence of brefeldin A. Intracellular expression of IL-17 was assessed on the indicated T cell subsets, defined by staining for CD3, CD4, CD8, NK1.1, β TCR, and γδ TCR. D, IL-17+ T cells from the epididymal AT of WT and TCRδ KO animals were evaluated for expression of β-TCR, γδ TCR, CD4, and CD8. IL-17+ events are represented in black, whereas total CD3+ T cells are represented in gray. Isotype control staining for IL-17 is shown for comparison with anti–IL-17. E, Total IL-17–expressing T cell load in AT expressed as mean total IL-17+ T cells per gram AT ± SEM (n = 4–5 per group). Columns also indicate the contribution of specific IL-17+ T cell subsets per gram of AT, as indicated. In fact, flow cytometry of adipose CD3+ T cells revealed a significant population of IL-17–producing lymphocytes in the AT of γδ KO mice, despite the expected absence of γδ TCR+ cells (Fig. 8D, 8E). These IL-17–expressing T cells are β TCR+, and include infrequent Th17 and Tc17 cells, but are predominantly CD4 and CD8 negative. They also lack the NK cell marker NK1.1. Phenotypically similar IL-17–expressing T cells are rare but present in WT AT (Fig. 8D, 8E). We conclude that γδ T cell deficiency leads to a compensatory accumulation of a distinct CD4−CD8− β TCR+ IL-17–expressing AT population, potentially representing expansion or recruitment of a normally rare double-negative IL-17–producing T cell subset. We have defined a role for IL-17, a T cell-expressed cytokine, in the regulation of body weight, adipocyte differentiation, and insulin and glucose homeostasis. We show that, in normal mice, IL-17 is expressed by γδ T cells in white AT, and that it can act directly on adipocytes and their progenitors to impair adipocyte differentiation, glucose and lipid uptake, and insulin sensitivity. Our findings implicate IL-17 in the regulation of adipogenesis, and in the metabolic functions of mature differentiated adipocytes. IL-17 treatment during in vitro differentiation of adipocytes from precursors significantly reduced the frequency of cells capable of accumulating lipid, consistent with a reduction in mature adipocyte numbers or impairment of adipocyte function. Moreover, IL-17 inhibited the induction of multiple genes whose expression is characteristic of mature adipocytes, including adipokines (adipsin), and genes involved in lipid (fatty acid binding protein 4, perilipin, adipose triglyceride lipase) and glucose metabolism (glucose transporter-4). Our in vitro findings with mouse-derived 3T3-L1 preadipocytes are consistent with recent studies demonstrating IL-17 inhibition of adipogenesis using human mesenchymal stem cells (40). IL-17 did not significantly inhibit insulin-dependent fatty-acid uptake or enhance lipolysis with mature 3T3-L1 adipocytes (data not shown). 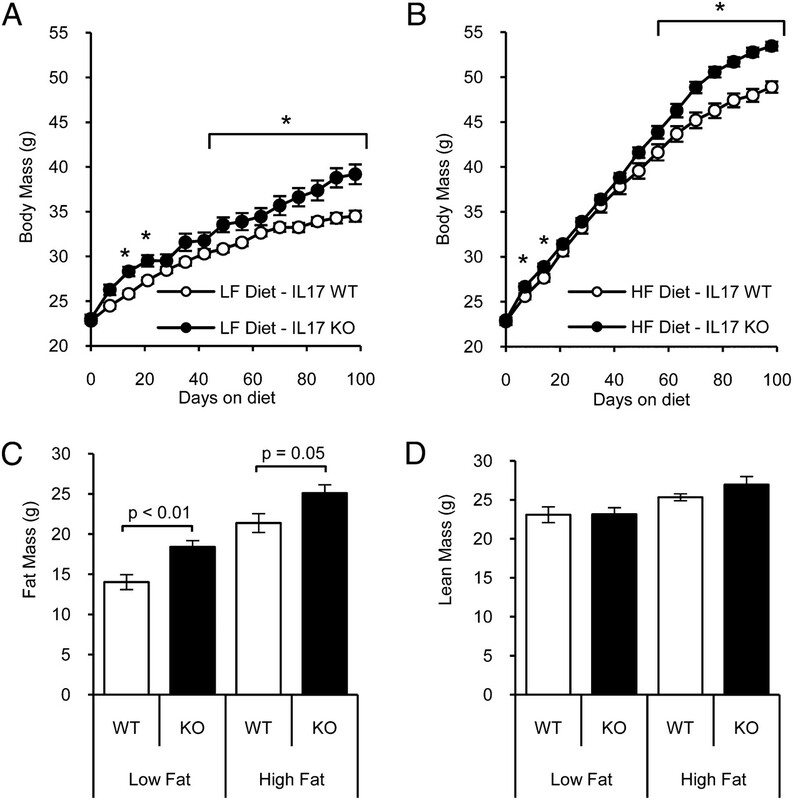 Inhibition of adipocyte differentiation by IL-17 may contribute to its attenuation of AT accumulation in LF and HF diet-fed mice. The specific mechanisms by which IL-17 regulates adipogenesis and adipocyte metabolism will require further study, but a number of mechanisms are likely to participate. IL-17 induces expression of IL-6 in preadipocytes and, in previous studies, in fibroblasts (41); IL-6 is reduced in the serum of IL-17 KO mice. IL-6 is known to induce insulin resistance in vitro and in vivo (15, 42), and it reduces mature-onset obesity in mice (43). IL-17 also inhibited the induction of genes encoding transcription factors (C/EBP-α, PPAR-γ) that are essential for efficient adipocyte differentiation (44). Inhibition of these genes would negatively impact the differentiation program. IL-17 treatment of preadipocytes also triggered signaling pathways implicated in adipogenesis and adipocyte functions, as evidenced by ERK1/2 and Akt phosphorylation. These pathways regulate in vitro adipogenesis in a complex fashion depending on the stage of differentiation, the cellular environment, and the kinetics of pathway activation (45–47); for example, early ERK1/2 activation is important for preadipocyte proliferation, but chronic activation inhibits preadipocyte differentiation to mature adipocytes (38). Inhibition of specific genes required for mature adipocyte function could clearly contribute to the effects of IL-17. For example, reduced expression of the lipid transporter, fatty acid binding protein 4 (FABP4, also known as aP2), is expected to inhibit lipid accumulation (48), and reduced expression of the glucose transporter (glucose transporter 4) may contribute to IL-17 moderation of glucose uptake. We found no evidence that IL-17 could impair the mitotic clonal expansion that occurs within the first 18 h of 3T3-L1 differentiation (39), nor could we detect any toxic effect on cell metabolism or survival, indicating the antiadipogenic effects of IL-17 are unlikely because of reduced cell viability. Our in vivo studies suggest that IL-17 contributes significantly to systemic glucose homeostasis as well. IL-17 deficiency enhances glucose tolerance and insulin sensitivity in young mice. These systemic effects mirror the improved glucose uptake and insulin responses of adipocytes in the absence of IL-17 in vitro. IL-17 deficiency is also associated with modestly greater fasting glucose levels. Basal hyperglycemia is a hallmark of insulin resistance, a feature of the metabolic syndrome associated with obesity (49). However, the young WT and KO mice used in these glucose and insulin challenges were lean, with no significant differences in mass, indicating that IL-17 contributes to systemic glucose homeostasis even before the onset of obesity. It is interesting to note that IL-17 deficiency was also associated with a significant reduction in serum insulin. Reduced basal insulin levels are often indicative of improved insulin sensitivity, which may contribute to the more efficient glucose metabolism observed; but the modest fasting hyperglycemia observed in IL-17–deficient mice suggests that control of basal insulin secretion may also be affected. Notably, although IL-17–deficient mice display improved metabolic responses before the onset of obesity, they are also more susceptible to accumulating greater AT mass than WT mice over time. A similar phenomenon is seen in both mice and humans treated with thiazolidinedione PPAR-γ agonists (e.g., rosiglitazone, pioglitazone, and troglitazone) (50). Mammals treated with thiazolidinediones also, paradoxically, experience improved insulin sensitivity together with enhanced AT mass accumulation; however, the mechanisms that mediate these effects are not fully known. One hypothesis suggests that the proadipogenic properties of glitazones may facilitate adipocyte differentiation, leading to a greater mature adipocyte pool that can act to take up systemic glucose, thus reducing systemic glucose levels and improving glucose tolerance (50). In addition, thiazolidinediones have anti-inflammatory properties that may help reduce systemic inflammation in obese patients, thus reducing systemic levels of proinflammatory cytokines that can contribute to obesity-associated insulin resistance (51). IL-17 deficiency may have similar effects in that it enhances adipocyte differentiation, leading to increased AT mass accumulation over time, and reduces systemic inflammation, resulting in improved metabolic parameters before the onset of obesity. Although young IL-17–deficient mice have improved metabolic responses compared with WT mice, protection from the metabolic syndrome in IL-17 KO mice was lost on the development of age-associated obesity. Approximately 6-mo-old IL-17 KO mice fed either an LF or HF diet were modestly more obese and had similarly impaired GTT and insulin tolerance test compared with WT control mice. The reasons for this phenomenon are unclear; however, it may reflect an advance of other mechanisms of obesity-related inflammation that overwhelm the effects of IL-17 deficiency. As mentioned earlier, in WT mice, IL-17 may contribute to systemic inflammation before the onset of obesity, thus predisposing them to metabolic syndrome compared with IL-17–deficient mice. IL-17 may not only inhibit adipogenesis, but may contribute to immune cell recruitment, as IL-17 can induce the expression of various chemokines important for leukocyte tissue infiltration (e.g., MCP-1, MCP-3, IP-10, MIG) (52), which may further exacerbate AT inflammation. However, as obesity progresses, IL-17 KO mice suffer from accelerated AT accumulation and obesity. It is likely that the larger AT deposits in IL-17 KO mice still experience the inflammation-inducing insults that occur in WT AT (e.g., necrosis, hypoxia) (53–56), followed by immune cell infiltration; AT-associated inflammatory factors (e.g., TNF-α, IL-1β, IL-8) secreted from IL-17–deficient AT leukocytes could contribute to systemic insulin resistance, despite the lack of IL-17. Moreover, we cannot rule out possible age-related changes in systemic responses to IL-17. We also found greater serum adiponectin in young mice deficient for IL-17, suggesting that the cytokine inhibits adiponectin expression in vivo as it does in vitro. Adiponectin is expressed exclusively by mature adipocytes, and its serum concentration is negatively correlated with obesity (57, 58). Thus, its enhanced expression in lean IL-17 KO mice is consistent with a direct role for IL-17 in AT in vivo. Together with our in vitro studies, our results suggest that the primary influence of IL-17 is in the systemic regulation of glucose homeostasis before development of obesity, and the cytokine has a beneficial effect in delaying AT accumulation, likely reflecting local effects on adipocyte precursors. Our discovery of γδ17 T cells in AT complements recent analyses of cytokine-producing conventional (αβ TCR-expressing) T cell subsets. As confirmed in our data, although Th17 cells are rare in AT, IFN-γ–producing Th1 cells are abundant (6, 7). γδ T cells were observed in AT as a minor T cell subset that increases significantly in inguinal AT during obesity (36, 37). Consistent with this, our studies demonstrate an increase in inguinal AT γδ T cell content (data not shown); however, this increase in γδ T cells was not observed in visceral, epididymal AT. Visceral and s.c. AT also differ in their content of CD4 Th cells and Tregs, and in the alterations seen in these conventional T cell populations in obesity (7). The reasons for this distinction are not known but may reflect the fundamental differences in the biology of these AT deposits (36, 59). Previous studies have described significant differences in T cell frequencies between inguinal (s.c.) versus epididymal (visceral) AT. For example, it was shown that, among lymphocytes, the frequency of NK cells is reduced in the epididymal AT, but not the inguinal AT, in animals fed an HF diet compared with animals fed a LF diet. Furthermore, αβ T cell frequency is significantly reduced in the inguinal AT, but not the epididymal AT, in animals fed an HF diet (36, 37). We also observed significant differences in the two AT depots; although in both sites γδ, T cells are the major IL-17–producing T cell subset. The frequency and absolute number of γδ17 T cells per gram of fat increased substantially with HF feeding in the inguinal AT pads, but not in the epididymal adipose deposits. γδ T cells as a whole also increase in frequency in s.c. but not visceral AT during obesity, as confirmed by our studies (data not shown) and in previous studies (36, 37). It is not clear why these two AT depots differ in γδ17 and other T cell content, but the disparities may reflect differences in the state or extent of spontaneous versus obesity-induced inflammation between the two AT depots, or to their differential development or functions in metabolism. Obese visceral AT is thought to be the main AT depot responsible for contributing to the metabolic syndrome and is generally considered to be more inflamed than s.c. AT. Indeed, in obese mice, both depots show an increase in the percentage of T cells that express IFN-γ (6, 7), a proinflammatory cytokine that worsens insulin tolerance in vivo (6), but only obese visceral AT shows a decrease in anti-inflammatory Tregs (29). Interestingly, our data show that, although γδ and γδ17 T cell infiltration increases with HF feeding in s.c. inguinal (but not in epididymal) AT, visceral epididymal AT, in fact, contains a high number of γδ17 T cells per gram under both dietary conditions (LF or HF), comparable with that reached in inguinal AT on the HF diet. Thus, the inflammatory infiltration and dietary responses of visceral versus s.c. AT differ in a complex way that may contribute to their differential roles in metabolism. However, several studies indicate s.c. AT, in particular, deep s.c. AT (60), may also contribute to the development of the metabolic syndrome (60–62). A small but detectable subset of AT γδ T cells, from both inguinal and epididymal depots harvested from mice fed an HF diet for 16–18 wk, spontaneously expressed IL-17 in vitro without requiring experimental stimulation. These cells were absent in AT from mice fed an LF diet. After a prolonged period of HF feeding (1 y), the frequency of spontaneous expression by inguinal AT γδ17 T cells reached surprisingly high levels (up to 20% of γδ cells). Although the basis for this remains unclear, the spontaneous expression of IL-17 by a subset of γδ T cells suggests that γδ17 cells may be activated in the AT by yet unknown ligands. Most known γδ TCR ligands are self-determinants associated with stress responses (e.g., T10/T22 and MICA/B) (63), and one possibility is that adipocyte distress response factors can act as ligands for γδ TCRs. Indeed, obese AT is associated with increased tissue hypoxia and adipocyte necrosis (53–56). Emerging studies demonstrate that γδ T cells are important for establishing inflammation and are responsible for IL-17 expression during the first several days of infection or during the onset of autoimmune disease (64, 65). Thus, the local secretion of IL-17 by γδ T cells may not only reflect low-level inflammatory changes associated with adipocyte stress, but may help orchestrate the progression of inflammatory changes that exacerbate the metabolic syndrome. In this context, it is intriguing that, in the absence of γδ T cells (in TCRδ KO mice), IL-17 production in AT appears to be taken on by a phenotypically distinct, predominantly CD4−CD8− β TCR+ population, consistent with a fundamental significance of the cytokine in adipocyte biology. This observation is also consistent with a similar replacement of γδ T cells with αβ T cells in the skin of TCRδ KO mice (66). We conclude that IL-17 participates in the complex interplay between inflammation and metabolism, with systemic effects on glucose homeostasis and a negative regulatory role in adipogenesis and adipocyte function. We thank Y. Chien (Department of Microbiology and Immunology, Stanford University) for insightful scientific discussion; both J. Kolls (Department of Pediatrics, University of Pittsburgh, Children’s Hospital of Pittsburgh) and Y. Iwakura (Institute of Medical Science, University of Tokyo) for graciously supplying the IL-17 KO mice; and S. Adler (Department of Pathology, Stanford University), B. Nazario (University of California, Santa Cruz), and E. Murphy (MERCK, Palo Alto) for expert technical assistance. Disclosures B.J.-S. and D.J.C. are employees of MERCK. All other authors have no financial conflicts of interest. This work was supported by the National Institutes of Health (Grants DK-084647, AI-47822, AI-079320, and AG-028908), the Specialized Center of Research (HL-67674), the FACS Core Facility of the Stanford Digestive Disease Center (DK-56339), a Merit Award from the Department of Veterans Affairs, and a National Institutes of Health predoctoral fellowship (AI073198).
. 2008. Clinical and laboratory diagnosis of the metabolic syndrome. J. Clin. Pathol. 61: 697–706. 2003. Adipogenesis: a cross-talk between cell proliferation and cell differentiation. Ann. Med. 35: 79–85. 2005. Adipogenesis: cellular and molecular aspects. Best Pract. Res. Clin. Endocrinol. Metab. 19: 483–499.
. 2007. Adipokines as emerging mediators of immune response and inflammation. Nat. Clin. Pract. Rheumatol. 3: 716–724.
. 2007. Chemerin, a novel adipokine that regulates adipogenesis and adipocyte metabolism. J. Biol. Chem. 282: 28175–28188.
. 2008. Interferon-gamma, a Th1 cytokine, regulates fat inflammation: a role for adaptive immunity in obesity. Circ. Res. 103: 467–476.
. 2009. Normalization of obesity-associated insulin resistance through immunotherapy. Nat. Med. 15: 921–929.
. 1994. Troglitazone prevents the inhibitory effects of inflammatory cytokines on insulin-induced adipocyte differentiation in 3T3-L1 cells. Endocrinology 135: 2279–2282.
. 1999. Tumor necrosis factor alpha stimulates lipolysis in adipocytes by decreasing Gi protein concentrations. J. Biol. Chem. 274: 6770–6775. 2006. Release of interleukins and other inflammatory cytokines by human adipose tissue is enhanced in obesity and primarily due to the nonfat cells. Vitam. Horm. 74: 443–477.
. 2007. Obesity-induced inflammation: a metabolic dialogue in the language of inflammation. J. Intern. Med. 262: 408–414.
. 2008. Endocrine and metabolic effects of fat: cardiovascular implications. Am. J. Med. 121: 366–370.
. 2001. The hormone resistin links obesity to diabetes. Nature 409: 307–312.
. 2003. Adiponectin expression from human adipose tissue: relation to obesity, insulin resistance, and tumor necrosis factor-alpha expression. Diabetes 52: 1779–1785.
. 2001. Adipose tissue tumor necrosis factor and interleukin-6 expression in human obesity and insulin resistance. Am. J. Physiol. Endocrinol. Metab. 280: E745–E751. ; International Psoriasis Council. 2007. Obesity in psoriasis: the metabolic, clinical and therapeutic implications. Report of an interdisciplinary conference and review. Br. J. Dermatol. 157: 649–655.
. 2009. Body size and risk of MS in two cohorts of US women. Neurology 73: 1543–1550.
. 2009. Obesity predisposes to Th17 bias. Eur. J. Immunol. 39: 2629–2635.
. 2007. The interplay of obesity and asthma. Curr. Allergy Asthma Rep. 7: 385–389.
. 2006. Role of interleukin-17 and interleukin-17-induced cytokines interleukin-6 and interleukin-8 in unstable coronary artery disease. Coron. Artery Dis. 17: 699–706.
. 2008. Th17 cells: a new therapeutic target in inflammatory dermatoses. J. Dermatolog. Treat. 19: 318–326.
. 2008. Chronically inflamed human tissues are infiltrated by highly differentiated Th17 lymphocytes. J. Immunol. 180: 7423–7430.
. 2008. Th17 cells: a new fate for differentiating helper T cells. Immunol. Res. 41: 87–102.
. 2009. Increased activity of interleukin-23/interleukin-17 proinflammatory axis in obese women. Int. J. Obes. (Lond). 33: 151–156.
. 2007. Human adipose tissue macrophages are of an anti-inflammatory phenotype but capable of excessive pro-inflammatory mediator production. Int. J. Obes. (Lond). 31: 1420–1428.
. 2006. CCR2 modulates inflammatory and metabolic effects of high-fat feeding. J. Clin. Invest. 116: 115–124.
. 2003. Obesity is associated with macrophage accumulation in adipose tissue. J. Clin. Invest. 112: 1796–1808.
. 2009. Lean, but not obese, fat is enriched for a unique population of regulatory T cells that affect metabolic parameters. Nat. Med. 15: 930–939.
. 2009. CD8+ effector T cells contribute to macrophage recruitment and adipose tissue inflammation in obesity. Nat. Med. 15: 914–920.
. 2009. T-ing up inflammation in fat. Nat. Med. 15: 846–847.
. 2005. Antigen recognition determinants of gammadelta T cell receptors. Science 308: 252–255.
. 1991. Recognition of self antigens by skin-derived T cells with invariant gamma delta antigen receptors. Science 252: 1430–1432. 2006. Immunosurveillance and immunoregulation by gammadelta T cells. J. Invest. Dermatol. 126: 25–31.
. 2005. Adipose tissues as an ancestral immune organ: site-specific change in obesity. FEBS Lett. 579: 3487–3492.
. 2006. Weight-dependent changes of immune system in adipose tissue: importance of leptin. Exp. Cell Res. 312: 2195–2202.
. 2005. The role of MAPKs in adipocyte differentiation and obesity. Biochimie 87: 51–56.
. 1998. Transcriptional control of adipogenesis. Curr. Opin. Cell Biol. 10: 165–173.
. 2009. Interleukin-17A inhibits adipocyte differentiation in human mesenchymal stem cells and regulates pro-inflammatory responses in adipocytes. Biochem. Pharmacol. 77: 1835–1844.
. 2004. 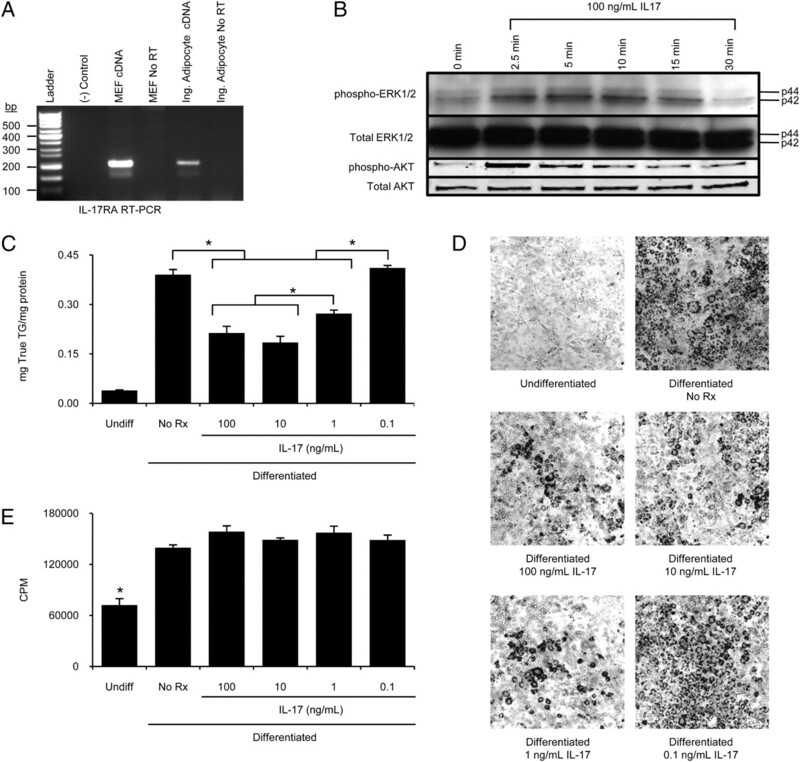 IL-17 induces production of IL-6 and IL-8 in rheumatoid arthritis synovial fibroblasts via NF-kappaB- and PI3-kinase/Akt-dependent pathways. Arthritis Res. Ther. 6: R120–R128.
. 2002. Interleukin-6-deficient mice develop mature-onset obesity. Nat. Med. 8: 75–79. 2005. The transcriptional basis of adipocyte development. Prostaglandins Leukot. Essent. Fatty Acids 73: 31–34.
. 2003. Mitotic clonal expansion: a synchronous process required for adipogenesis. Proc. Natl. Acad. Sci. USA 100: 44–49.
. 1996. Inhibition of adipogenesis through MAP kinase-mediated phosphorylation of PPARgamma. Science 274: 2100–2103.
. 2006. Endothelin-1 inhibits adipogenesis: role of phosphorylation of Akt and ERK1/2. FEBS Lett. 580: 5765–5771.
. 2008. Fatty acid-binding proteins: role in metabolic diseases and potential as drug targets. Nat. Rev. Drug Discov. 7: 489–503.
. 2008. The metabolic syndrome. Endocr. Rev. 29: 777–822.
. 2003. PPARgamma agonists in the treatment of type II diabetes: is increased fatness commensurate with long-term efficacy? Int. J. Obes. Relat. Metab. Disord. 27: 147–161. 2008. Thiazolidinediones as anti-inflammatory and anti-atherogenic agents. Diabetes Metab. Res. Rev. 24: 14–26.
. 2006. The IL-17 cytokine family. Vitam. Horm. 74: 255–282.
. 2008. Dead adipocytes, detected as crown-like structures, are prevalent in visceral fat depots of genetically obese mice. J. Lipid Res. 49: 1562–1568.
. 2005. Adipocyte death defines macrophage localization and function in adipose tissue of obese mice and humans. J. Lipid Res. 46: 2347–2355.
. 2007. Adipose tissue hypoxia in obesity and its impact on adipocytokine dysregulation. Diabetes 56: 901–911.
. 2008. Obesity in C57BL/6J mice is characterized by adipose tissue hypoxia and cytotoxic T-cell infiltration. Int. J. Obes. (Lond). 32: 451–463.
. 2007. Adiponectin and the metabolic syndrome: mechanisms mediating risk for metabolic and cardiovascular disease. Curr. Opin. Lipidol. 18: 263–270.
. 1999. Paradoxical decrease of an adipose-specific protein, adiponectin, in obesity. Biochem. Biophys. Res. Commun. 257: 79–83.
. 2006. Metabolic obesity: the paradox between visceral and subcutaneous fat. Curr. Diabetes Rev. 2: 367–373.
. 2002. Lipolysis in adipocytes isolated from deep and superficial subcutaneous adipose tissue. Obes. Res. 10: 266–269.
. 2004. Both subcutaneous and visceral adipose tissue correlate highly with insulin resistance in african americans. Obes. Res. 12: 1352–1359.
. 2000. Subdivisions of subcutaneous abdominal adipose tissue and insulin resistance. Am. J. Physiol. Endocrinol. Metab. 278: E941–E948.
. 2008. Thymic selection determines gammadelta T cell effector fate: antigen-naive cells make interleukin-17 and antigen-experienced cells make interferon gamma. Immunity 29: 90–100.